The market next to our home gets busy during the weekends. I used to buy fresh vegetables & groceries during the weekends and store them in refrigerator for the following week's usage. Only exception is, “I don't store greens inside the fridge”. I buy it and consume it immediately when it is fresh. Last Sunday, I bought fresh spinach from the nearby market to prepare Dal Spinach for lunch. All my cousins paid a surprise visit last Sunday. The time was 9.30 AM and they were yet to complete their breakfast. Sometimes, it is difficult to get ideas when guests visit our home as what dish can be prepared with the available ingredients in the kitchen. I was thinking what to prepare for breakfast and lunch and my mind settled on Poori as everyone likes Poori. 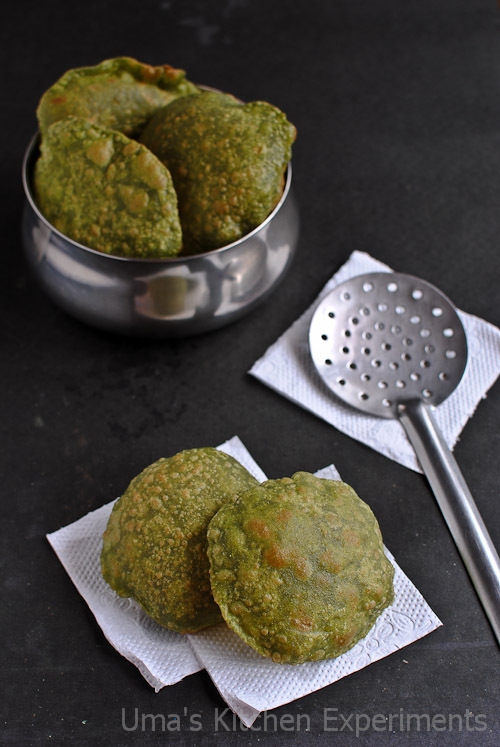 Poori is a special dish among Indian households. We prepare it most of the time when guests visit our home. At the same time I was thinking as what can be done with the spinach. It can’t last for long and there wasn’t enough spinach to make a dish of sizable quantity for lunch. So, I decided to include spinach preparing poories. The end result is Palak Poories with potato masala. Doesn’t it sound a good combination? The dish turned out to be good and everyone liked the green color of the poories which was a refreshing change from the golden brown color. Do you want to know what I prepared for lunch? Well, it is an Andhra meal which includes Annam (Steamed rice), Pappu koora (Dal using toor dal), Bendakaya pulusu (Okra in tamarind gravy), Sithapandu chaaru (Tamarind Rasam), Chintha chiguru podi (tamarind leaves peanut powder), Arati Puvvu curry (Banana flower dry curry), Karuveppilai thokku, Thandu keerai poriyal, avakaya oorugaya (Andhra mango pickle) and ghee. :-) Long list indeed. 1) Remove the stems and wash the spinach leaves. Cut the leaves into small pieces and blanch it with hot water. Allow it to cool to room temperature. 2) Grind it to a fine paste along with green chillies. 3) Take wheat flour in a wide mixing bowl. 4) Add the ground spinach leaves. 6) Add water slowly and make a very tight dough. If required add a teaspoon of oil. 7) Divide the dough into lemon size balls. Roll each of them into round shapes using a rolling pin. Dust it with flour or oil to help rolling. 8) Heat oil in a frying pan. When it is hot and not smoking, add the poories one by one. Slightly press on each side to allow the poories to puff up. 9) When both the sides are cooked (the instance when the color turns to golden brown), transfer the poories to the bowl covered with paper tissues. The paper tissues will help to drain the excess oil. 10) Serve hot with potato kurma/ potato masala. 1) Addition of green chilli is optional. 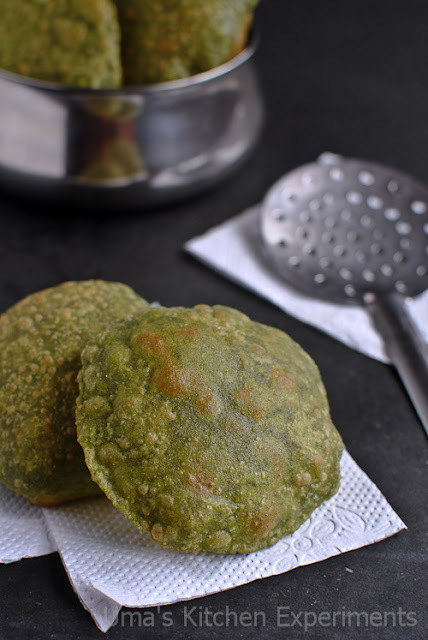 Without green chilli, you can directly add the ground spinach paste to the flour to make dough. 2) Add ajwain/carom seeds or cumin seeds to the dough (optional). 3) The dough should be tight and the temperature of the oil should be hot. Test it with a very small pinch of dough. It should immediately come to the surface of the oil. Otherwise, the poories will absorb more oil and poories will become soggy. looks sooooooooo tempting n lovely clicks!!! Yummyyy poori..my son loves palak poori!!! In a little healthy way!!! looks awesome! 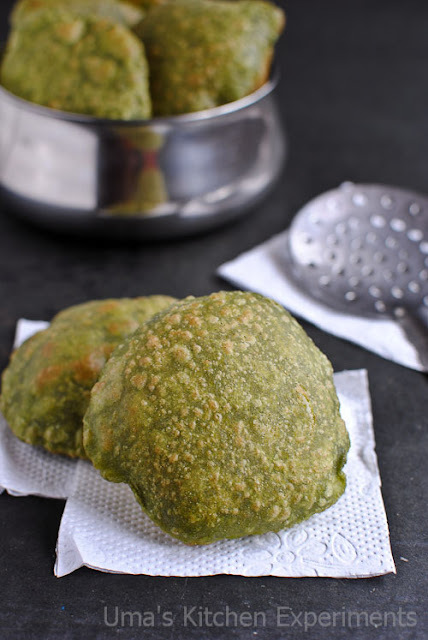 Love this green fluffy pooris, my fav. 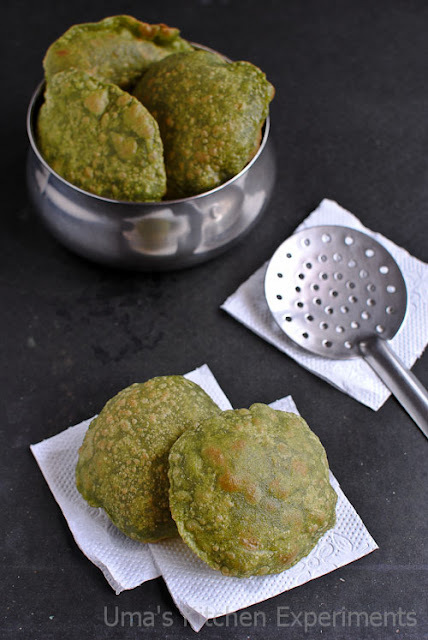 Healthy poories,...Nice choice for healthy dinner..
Lovely puris..love the use of spinach. I love these pooris..I am wondering how u got time 2 take the pics when u hv guests at home..;) saw ur lunch list,u know Telugu?? The colour is so attractive if not the health quotient. Happy new year uma! Spinach poori looks really yumm. Love the color.